Amazons, I was sick last week. Like nasty, awful, can’t leave the house sick. My head was swollen and my neck ached and my nose was screaming. I’ve been trying to not succumb to the siren call of NYC delivery, so what’s a girl to do for sickly sustenance? This is when having a few basics in your kitchen at all times really pays off. Once I was feeling well enough to brave the kitchen, I went straight for my cache of homemade chicken stock in the freezer. But how to dress it up? I swear these are all just things I had sitting around. Start by sweating the onion in a drizzle of olive oil in a pot over medium to med-low heat. When it’s getting soft and translucent, add your garlic. Hit with some salt to help draw the moisture out of your onion and garlic. Add paprika and cayenne, letting the flavors mingle for a few minutes. Add chicken stock and rosemary sprigs. Bring to a simmer. Add in the juice of one lemon. Keep tasting and adjusting seasoning as necessary. You’ll want to let this simmer, covered, for at least 15 minutes to allow the flavors to come together. 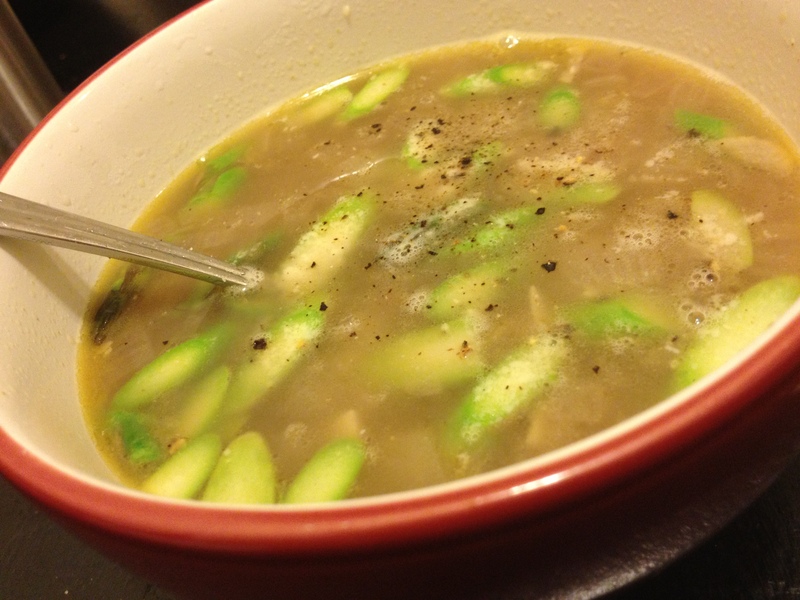 Remove rosemary sprigs and ladle your hot broth over the asparagus and garnish with parmesan and fresh black pepper. The idea behind this post is to show you that making a soup is dead simple. I could’ve added any veggies, herbs, or meat I had lying around. And the options for flavor combinations are limitless. Start with aromatics (onion, garlic, carrot, celery), layer on seasoning and liquid, add any chunky bits you have. The more delicate the item, the later it should be added.